BROADCASTING 1: How do you find your Teacher? we shall be talking today about one of the most important subjects of Agni Yoga: How can you find your teacher? Agni Yoga insists: Without a teacher there is no progress on the spiritual path. Alone, you will not advance at all, or at least so painfully slow, that you will lose the connection with the progressing evolution. It is stated clearly and unambiguously: You cannot practice Agni Yoga without a teacher. Nevertheless, there is hardly any Agni Yogi today who knows or who at least seriously and with all his strength searches for his teacher. All religions of all times teach: To walk the Spiritual Path – the path to God – means to follow someone who is ahead of you on the same trail. It means to go on the same path on which all the great Masters have already walked long before you. On this path you cannot go wrong. If you deviate from it, you are lost. Without something above you, you do not know where to turn, and wander about aimlessly and without orientation. This is the disease of our time: Men refuse to recognize anything greater than themselves and deny the Hierarchy. Remember your childhood! Every child has his hero. Is not it deplorable that you have lost this pure ideal? If you wish to ascend, it is sensible for you to look up to those who have already reached the next level. The little souls follow the great ones. Thus, Hierarchy turns from an abstract concept to the guideline of your earthly life. You will be able to grow only if you orientate yourself to the higher levels and follow their example. Only there you can find true models. The religious doctrines of our days suffer from a grave error: They deify great teachers such as Buddha, Jesus, or Mohammed to such an extent that the faithful are scarcely able to find a living connection with them. Medievalism made an inaccessible idol of Christ and deprived him of any humanity, therefore also of divinity. Such a forced separation of Christ from human essence threatened and still threatens a complete break in the communion of humanity with the Higher World. When men began to make of Christ an inaccessible idol, there began a period of visions of Christ in most realistic forms. He appeared as very close to men, entering into their daily life. As an Agni Yogi, however, you know: All higher creatures, right up to God, were once ordinary human beings like you and me. They lived in circumstances, no better than ours today, and have risen from there. As the Sons of God have worked their way up from the very bottom to the heights where they are now dwelling, you, as a disciple who wishes to imitate them, have no choice but to follow them on the same track. The worship of a master alone is abstract and dead. The succession of a master is a living practice of daily life. The book of Thomas à Kempis “The Imitation of Christ” has long been appreciated in the East not only by virtue of its content but because of the meaning of its title. In the midst of medieval idolatry of Christ, the voice of Thomas à Kempis resounded in protest. From behind the walls of a Catholic monastery rang out a voice to clarify the Image of the Great Teacher. The very word imitation comprises a vital action. The formula—Imitation of Christ—is an achievement of daring innate in the conscious spirit that accepts all responsibility of creation. Truly, the conscious disciple dares to approach the Teacher in imitation. What is more natural than to follow those who are a few steps ahead of us on the path? It is of the utmost importance that you realize: The whole striving, the whole success of a Mahatma consists in stimulating imitation. He has come to earth with the aim to find disciples who follow him to the heights. If he is unable to convince anyone to walk the same path, his sacrifice was in vain and his mission has failed. Wherein lies the success of a yogi? It is not in the attraction of crowds, not in the conversion of multitudes. But, near the works of the yogi, one can observe how others imitate him. Consciously or unconsciously, voluntarily or involuntarily, people begin to do the same thing. Even his enemies, while cursing him, follow the same path. It is as if a special atmosphere had gathered about the actions of the yogi. This is a true success, when neither money nor fame, but the invisible fire kindles human hearts. Desiring to imitate him, these ignited hearts enter the yogi’s atmosphere. We humans distort his intentions terribly when we lift him up into Heaven and cover his image with a wreath of impenetrable dogmas, instead of simply following him on the Spiritual Path. The source of this distortion is indolence: The fatal tendency to indulge in abstract worship rather than to redesign one's daily life in accordance with the teacher's commandments. To be a Christian means to become like Christ. To be a Buddhist means to turn into a Buddha. Each of you can become a disciple of Christ: You only have to follow him! The one who best and most faithfully carries out this task will become like him and thereby renew his image on earth – exactly as St. Francis of Assisi did, thereby giving a shining example. The Mahatmas are watching us humans and know very well who of us is really following them, who only makes empty words, and who even opposes them. It is a true catastrophe in the spiritual sense: For centuries, since the prime of the monks' orders, the Western world has ceased to produce any real teachers of life; namely masters who practice the sanctification of their Ego first hand, and instruct disciples to imitate them. Our culture brings forth priests who make beautiful words on the pulpit on Sundays, and heaps of abstract, comfortable and non-committal literature. But there is no one who sets an example; no one who himself advances exemplarily on the eternal path of the soul in such a way that he inspires the best disciples to succession. It has come so far that that what is actually the highest mission of every human being, namely the succession of a great master, is regarded as unheard of. We are lacking a whole tradition, mental attitude, and readiness, which are, however, sorely needed if the development is to go upwards again in the spiritual sense. The Law of Hierarchy demands that the Western man accepts the Eastern concept of teacher and disciple (Guru and Chela). Only in this way can we build a new, higher and more beautiful step of evolution. Only when you decide to take a teacher and follow him, will the spiritual path turn from a dead, non-committal abstraction to a living reality which shapes your whole everyday existence. It is the very essence of the Spiritual Path to choose a spiritual leader and prove to be a worthy disciple of him. Nobody among you would consider to become a craftsman, for example a carpenter or a shoemaker, to start a career as pianist or violinist, or begin with a sport like tennis or chess, without making an apprenticeship with a master of the subject. Of course, you will only obstruct your own development if you refuse to learn from those who know better than you. This is particularly true for those walking on the Spiritual Path. It is the teacher alone who elevates the disciple up to a higher level. It would simply not be goal fitting to refuse to follow those who have advanced farther than we ourselves. Therefore, it is impossible to practice Agni Yoga without a teacher. He who places himself outside of Hierarchy will neither be able to find the right way nor to fulfill his mission. It is sad to see how in this way many great, well-intentioned efforts remain without result. Have you ever asked yourself why your exertions are not successful? Only a Hierarch can guide your actions to the right direction. Therefore, a firm connection with the Hierarchy is the indispensable foundation of every construction. The Hierarchy is a chain. To be a part of this chain means: You are connected to a chain link above and to a chain link beneath you. Each of us is at the same time both a disciple of a higher one and a teacher to all those standing beneath him. Your teacher is nothing else than the next higher link in the chain of the Hierarchy, to which you have to tie yourself firmly. Through him only are you connected with the still higher levels and with the Supreme Will emanating from the very top. The teacher is your personal connection with the Hierarchy. It is only by attaching yourself to your teacher that you yourself become a link in the chain. Thereby the Hierarchy, wherever you are standing, becomes a living reality of your everyday material earthly life. As you are being helped from above, you support those who stand beneath you. You follow your teacher, who in turn, being at the same time a disciple himself, follows an even greater one, and your disciples follow you. People have always instinctively sought the proximity of the great Masters. Therefore, if you want to walk the path of Agni Yoga, you have to search for your teacher, for the next higher, guiding level of the Hierarchy. You must know your true father! To whom else do you want to turn when you are in need and require advice or support? There is a necessity established by law which you may safely rely upon: The higher levels take you under observation as soon as you arouse their attention by your search, your aspiration and your actions. This law actually forces your teacher to turn his eyes onto you. How can you find your master? The first prerequisite is: Walk yourself the Spiritual Path and obey its laws! Only in this way can you prove to him that you are worthy to be accepted as a disciple. Above all, a thorough purification is required. Physically or spiritually polluted you cannot dare to step before the face of a great saint. The great spiritual law says: "Once the disciple is ready, the teacher appears." The disciple must have developed already a high and strong striving on the path towards that great ideal which the teacher embodies and exemplifies. Readiness requires further: Question yourself: What are the qualities of a disciple? Make an effort to acquire them and to renounce all those habits which are incompatible with your ideal. Finally, readiness means: Maximum concentration on the chosen ideal, which takes precedence over all other exertions. Their only consideration is the concentration on the chosen Great Ideal, on the unwavering and constant striving to approach it. Such concentration continues unceasingly. Whatever such a yogi or disciple is doing, his thought is always occupied by his Ideal. Everything is performed in the name of this Ideal, and he always feels in his heart the love and the presence of this Image. It is not you who decides. The teacher alone knows when a disciple has reached that stage where he is suitable and receptive to personal instruction. Searching means: Look for people who are close to you. In practice, you may visit spiritual centres in your neighbourhood and get to know the spiritual leaders who are teaching there. Search also for historical periods and countries you feel connected with. Look for communities you may be related to: For example Pythagoreans, Plato's Academy, the Stoics, the medieval monks' orders, Samurai, Theosophists and the like. Above all, you should study the lives, writings and letters of the great world teachers, saints, and spiritual heroes of all times and all confessions, from Pythagoras to Gandhi, from St. Catherine of Siena to Helena Blavatsky. In this illustrious circle you will certainly find a spirit who is akin to you. Develop your psychic energy, your spiritual powers, your higher, finer, inner senses. They will infallibly point out the right direction. According to the law of correspondence, your higher self is quite naturally drawn to the teacher who is in harmony with your nature. The spirit, whom they themselves have followed, speaks from their lives, their words, their deeds, and their writings in such a clear language that you, too, can follow him. Of course, it would be easier for you to join a contemporary teacher and be taught and guided by him. Of course, it would be a blessing for mankind if there were many Ashrams with enlightened masters and their disciples to whom the seeker could turn. However, as this is not the case in our time, because, as it is said in the Teaching, all the sanctuaries of the spirit were destroyed (AUM 109), you have no choice but to strive for an even greater achievement: To learn to be led by the spirit directly, without mediation by other men. In any case, a teacher, the higher he stands, reflects less his personal, individual self, and more the spirit which fills him. The lives of many saints, for example Catherine of Siena, Johanna of Orléans (Joan of Arc), Margareta Maria Alacoque or Bernadette of Lourdes prove that spiritual guidance from the world beyond is possible and often practised. The connection with the teacher is of a supratemporal and spiritual nature. It is not restricted by the limitations of matter, space and time. When you open your heart and allow its strings to resound, the teacher is always with you, even if his body has left the physical plane already centuries ago. The great goal is: To advance so far on the path of purification, to refine your inner, spiritual senses to such an extent that you can hear the voice even of a non-incarnated teacher. It is vital that you become a follower, a practitioner and a disciple of a particular philosophy and spiritual practice, for example a Pythagorean, a Stoic, a Samurai, or an Agni Yogi, and that you live according to its rules, habits and laws. A good teacher is someone who exemplifies this philosophy whenever he has lived. His perishable personality is not in the foreground. Remember: You must be worthy of the teacher you have chosen – the higher he stands, the more. Therefore, do not aim too high! Do not pursue an unachievable ideal. Be sure to stick to the next higher step of the Jacob’s ladder. It is a typical beginner's error to think that, already after the first steps on the Spiritual Path, one is entitled to turn to highest masters such as Buddha, Jesus or a Mahatma of the Brotherhood for personal guidance. The love you feel for these Great Souls may be genuine. It is, however, the love of a soldier for his general, in whose leadership he blindly trusts, although he can at most watch him from afar. As opposed to that, your personal guide is the officer or corporal standing closest to you. You cannot yet dare to turn to the general directly with your personal request. If someone is to lead you, he must not stand too far above your own consciousness. Do we really believe that the greatest masters like Christ Jesus will guide many of today’s human beings? It is known of Nicholas Roerich that he only had two disciples: Boris Abramow and Alfred Hejdok. There rules the age old principle: As below, so above. That means: No beginner on the piano or the violin, as a conductor or tennis player, would dare to direct his request to be accepted as a pupil immediately to highest masters such as Arthur Rubinstein, Yehudi Menuhin, Herbert von Karajan or Steffi Graf. Rather, you have to slowly and arduously work yourself up through many intermediate stages, through intermediaries of the high art, through disciples of disciples of a disciple of the great Master, until you become, on one distant day, worthy of the highest consecration –personal guidance by a Mahatma. Therefore, worshiping and following the saints is much more realistic than believing that every small man could turn directly to the highest levels, to Jesus, to angels or archangels, or even to God himself. The saint is the next level of evolution and thus the natural mediator between man and the higher spheres. You also have to recognize: For a teacher, every disciple is a burden and a great responsibility. He can, therefore, accept only those who have sufficiently proved their suitability; otherwise he would waste his precious time and energy. Rembrandt "The Return of the Prodigal Son"
Ultimately, you recognize your master through spiritual kinship: The teacher is your true, spiritual father; he whom Jesus calls the "Father in Heaven". He helps you to your second, spiritual birth, educates you like child, guides your steps and accompanies you on your Spiritual Path – not only today in your present incarnation, but already for thousands of years. Just as you have only one physical father, you only have one teacher as well. Those who constantly change from one guru to the other are going astray. This spiritual connection stands higher than any physical one. Remember! You know your father from your life in the world beyond before your present earthly existence. To advanced souls like Helena Roerich, who have cultivated a firm, conscious connection with their teacher for thousands of years, he shows himself already in their childhood. Urusvati [Helena Roerich] has kept in her heart from early childhood the revelation that the Teacher of Light lives “somewhere.” Only memories of reality could call forth in a child’s consciousness such a vivid image. We rejoice to see that Our co-workers, from their first conscious hours, bear within themselves an image of what they have previously seen. So if you strive to establish and strengthen this connection now, you will not have to search so arduously and for such a long time in your next life until you find your teacher. Ultimately, it is love that leads you to your spiritual father. Do you not feel the joy of the intimate contact with the one to whom you can look up, whom you can trust, from whom you can learn, who elevates you, and with whom you are safe? In your search for the teacher, use the real power of love: It actually has an attracting force! When you appeal to your "Father in Heaven" with burning love and longing – how could he remain silent? As below, so above (AY 225): Exactly like the terrestrial, the supermundane powers as well respond more surely the more urgently they are being invoked. As on earth, so in heaven the best connection to another being is forged by love. It is crucial that you remain unshakably convinced that your teacher actually lives. There is a next link in the hierarchical chain for everyone. Everyone has a spiritual father, you, too. You have lived with him before this incarnation in the world beyond and will return to him after death. Thus, if you only do not know his name yet, you may still turn to him without a name and simply and lovingly call him "father". Read the famous "Autobiography of a Yogi" and learn how Yogananda, after some trials and tribulations, finally meets his teacher, Sri Yukteswar; how father and son magnetically attract each other; how they recognize each other at first glance, and how they are filled with the certainty that they are meeting not for the first time. So will it be when you face your teacher – at the latest after death in the world beyond, but also one day in a – physical or spiritual – encounter on the material level. 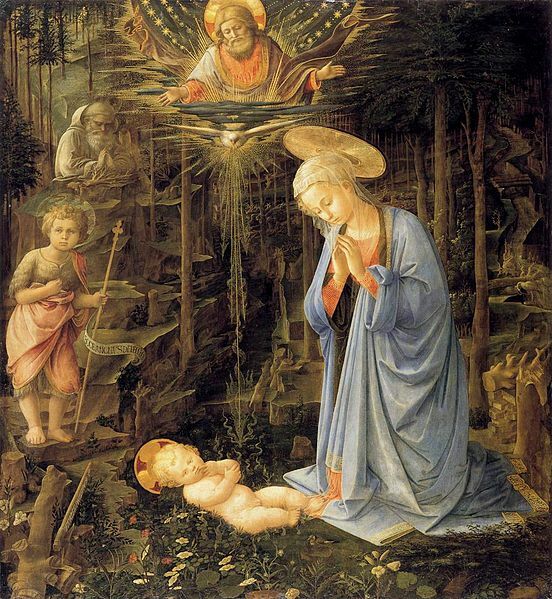 Filippo Lippi "Adoration in the forest"
Soon after the first steps on the Spiritual Path, I felt a deep longing to recognize my spiritual father and to communicate with him. I started my search by reading biographies of saints. Quite naturally, a few figures came to light, to whom I felt a spiritual proximity. One day I had work to do in Berlin. In a break I visited the picture gallery there. For a long time, I lingered in front of the mediaeval painting of an Adoration which at first glance has nothing special about it. A few weeks later I had to go to Berlin again. Again there was a break, and I went once more to the same museum – but only to look at the same painting for a second time. It exerted a strong attraction on me. It seemed to summon me: "Come back to me. I still have something to tell you." Though I am very fond of admiring the old masters, it is nevertheless unusual that I visit the same museum twice within a few weeks’ time. Again I lingered for a long time in contemplation before the painting. Only now did I notice a brochure with more detailed information on the works exhibited. Through it, my attention was drawn to the fact that in the background of my painting there is depicted a saint who is looking at the scene. He had so far completely escaped my attention. Moved to my heart, I read that he was one of those saints to whom my reading had already attracted me. This evident superior guidance gave me the joyful assurance that I had found my teacher. This realization was later confirmed and strengthened again and again by many other smaller signs. Thus, already in my early youth, I felt related to the country where and to the time when my teacher was incarnated. I immersed myself in his life and read his writings. Especially in the letters which he wrote to his monks when he was traveling, I felt so personally addressed as if a father was speaking to his son. Probably I was physically present in the refectory centuries ago, when these letters were read in the original to the community. In this way, you, too should search, namely by sensitively reading the signs that life itself offers to you. 12. Beware of false Teachers! Today as at all times, there are a lot of false prophets. Many self-proclaimed shepherds are looking for a flock – while it should be the other way round! You must learn to distinguish true from false teachers. If you follow the wrong leader, you will miss the path, and all your efforts will be in vain. The key question is: Does he show a path? Is it a spiritual path, or does he address the lower self, the physical, the material? And does he himself walk the path he is pointing out to others? Only the one who teaches not abstract principles, but above all their practical application in everyday life can furnish an example and serve as a guide. He who does not respect the free will of the disciples or aims at earning money with his teaching will not be a true master. Finally, do not form false, unfulfillable ideas of your teacher. If he is the next higher link in the infinite chain of Hierarchy, he does not stand so high above you that he is able to work miracles.